Every week Marvel has been announcing new titles for their Secret Wars line up. This week Marvel announced Star Lord and Kitty Pryde. This will be spinning out of Black Vortex and The Legendary Star Lord series. Kitty Pryde has been a supporting character for both this event and Star Lord's ongoing series. Star Lord and Kitty Pryde is going to put their relationship to the test. This will not be the Kitty Pryde of the 616 universe, but instead Kitty Pryde from Age of Apocalypse. She has claws coming out of her hands and seems very angry at Star Lord on the cover. Sam Humphries will continue writing the series and Alti Firmanshyah will be the new artist. 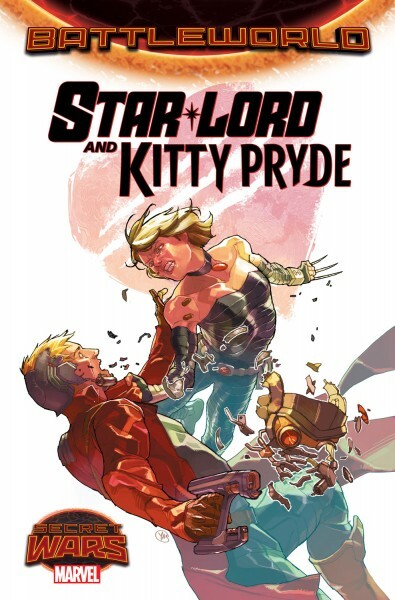 What are your thoughts for Star Lord and Kitty Pryde? Are you excited? Do you like Kitty Pryde and Star Lord together? Let us know in the comments below.